Since the middle of March, 2014, more than 30 individuals have been infected with MERS-CoV in the city of Jeddah in Eastern Saudi Arabia as reported by the Kingdom of Saudi Arabia (KSA) Ministry of Health. Almost half of these cases have been officially reported in the past five days. The official information provided by KSA on these cases is inconsistent. Onset dates after March 28, 2014, have not been reported for any the remaining 25+ cases. With the exception, of a father-son family cluster, few details are provided about the nature of the relationship between cases. Of these cases, 17 are reported as health care workers suggesting that many of these cases are a result of nosocomial infection. Four or five of these healthcare workers are reported as asymptomatic. The cases range in age from 25 to 71 years old. The mean age is 40 years old and the median age is 33 years old. The infected individuals in Jeddah are on the average younger than previously reported cases from Saudi Arabia. The median age for all MERS-CoV cases in Saudi Arabia is about 50 with a median age 53. As least five of the individuals in this outbreak in Jeddah have died, although most of the cases are still being treated. With an overall case fatality rate approaching 40% for reported MERS-CoV cases, more deaths can be expected from this outbreak. With little information about onset dates and the relationship between cases is it difficult to determine whether this outbreak is continuing to grow. Impressive work Al. I am outraged at how long it takes from diagnosis to a very sketchy report of the disease. - Male, 26, Jeddah, currently receiving treatment in intensive care - possibly health care worker according to media reports - Jeddah, Saudi Arabia Please note: This case was reported by the MoH on March 28. Death note. #213 - Man - 26, from the province of Jeddah and works in the health care sector, currently receiving treatment in intensive care - Saudi Arabia Please note: This case was reported April 2. #211 - Male, 26, Jeddah, currently receiving treatment in intensive care - possibly health care worker according to media reports - Jeddah, Saudi Arabia Please note: This case was reported by the MoH on March 28. Death note. The man from Malaysia who died (link) should be considered another case in the Jeddah outbreak. According to the World Health Organization (WHO) report today (link) the man visited Jeddah in the last half of March, during the same period that several cases in Jeddah experienced onset. The WHO notes that this individual visited a camel farm and drank camel milk in Saudi Arabia on March 26th. 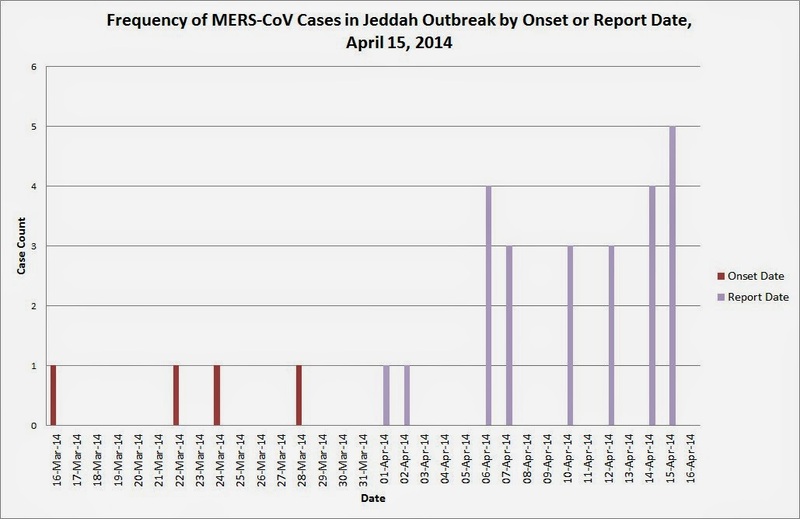 I believe this is the only MERS case in the Jeddah outbreak that has been reported to have animal contact. The lack of more details from the Ministry of Health about infection sources could lead to more speculation about sustained human-to-human transmission. A media report indicates that two traveling companions of the infected Malaysian man who visited Jeddah are now symptomatic in Malaysia. (link) If infected, these two individuals will increase the size of this outbreak and may represent a new separate geographic MERS cluster. (i) Of the large numbers of samples collected from patients with SARI, the great majority of those submitted to CPHL and NAMRU were naso-pharyngeal swabs. however, such specimens were rarely collected. In areas without equipment or capability to safely perform certain LRT sampling procedures, “induced sputum»” is a potential alternative, which is commonly used for tuberculosis testing. (ii) The samples collected were often of suboptimal quality. Successful laboratory diagnosis relies on sample quality, and it is important to obtain specimens using appropriate collection methods and transport them to the laboratory in good condition in a timely fashion. Recognizing the presence of MERS-CoV and avian influenza A(H5N1) virus in the region, there is an urgent need to raise awareness of clinicians on LRT specimen collection, training and equipment, to promote early and accurate laboratory diagnosis. as a direct result a targeted vaccination strategy is being discussed for this at-risk group. However, a large annual demand for seasonal vaccine to cover an estimated 2 million pregnancies poses challenges for countries with competing health priorities. (iv) In accordance with WHO clinical management guidance, provision of both empiric antiviral treatment and concomitant empiric antimicrobial treatment to patients with undifferentiated severe acute respiratory infection, pending further test results, is recommended when community circulation of the virus is known. (v) It is important to establish a communication channel and strategy to connect clinicians, laboratories, and public health officials in order to enhance appreciation of influenza activity and clinical diagnostic suspicion, a rapidly shifting balance of capacity and demand in the health-care system, and facilitate evidence-based clinical decision-making. (vi) Effective communication in the delivery of public health messages is a powerful tool in facilitating control and prevention efforts. -- such viruses (H5N1, MERS) may not be detected timely. Consequently, co-infection with H1N1pdm09 & / or MERS & / or other respiratory viruses cannot be excluded during outbreaks of severe respiratory illness in Middle East Region. The Saudi Arabia Ministry of Health announced another seven MERS cases from Jeddah today (link). It would seems that this MERS cluster is continuing to expand. The Jeddah outbreak is by far the largest geographic cluster of MERS cases in such a short time. Fewer health care workers are being identified in the most recent official media reports, so the currently reported cases no longer seems have resulted solely from nosocomial infections (link). #211 - Male*, 26, Jeddah, currently receiving treatment in intensive care - possibly health care worker according to media reports - Jeddah, Saudi Arabia Please note: This case was reported by the MoH on March 28. Death note. #213 - Man - 26, from the province of Jeddah and works in the health care sector, currently receiving treatment in intensive care - Saudi Arabia Please note: This case was reported by the MoH on April 2.